Put a spin on entertaining with a fresh, new, modern design. This lazy Susan is both functional as well as visually beautiful. A richly stained solid wood top set on a steel barrel hoop. Makes a perfect centerpiece for parties or everyday use. Dimensions: 4"H X 24" Dia. or 18" Dia. Can we put EST. 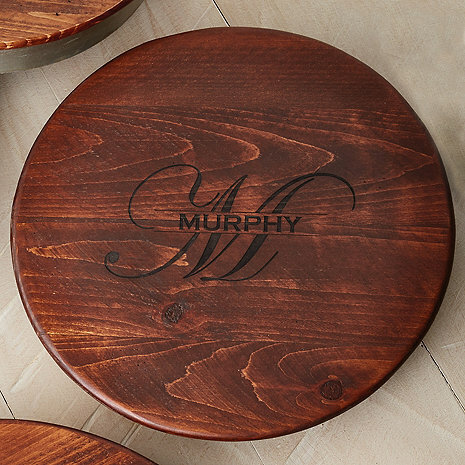 2018 on the bottom of the “name & script initial” lazy susan? I believe so but Wine enthusiast would be able to give you a definite answer. I only put our last name on ours. Wish I had thought about the EST addition...that will be very cool! We purchased the lazy Susan as a Christmas gift for some dear friends, it was absolutely beautiful and they loved it. I would definently recommend the company and the products. Shipping was in a timely manner even at the busy holiday season. No complaints at all. Great gift for your discerning friends! I’ve purchased 3 of these Lazy Susan’s as gifts and everyone has raved about what a nice and useful gift they are! You can’t go wrong with this one! It is a beautiful piece. We have one in our wine room and we have just given another one as a gift. Everyone loves them...very unique and they are BEAUTIFUL! Very solid and fit beautifully around the table. The name and initial are a nice touch. Arrived in a timely manner and packaged well. This was a gift and the recipients absolutely loved it.